The Sporty Fairies are in need of Rachel and Kirsty's help. Everyone in Fairyland is preparing for the Fairy Olympics, but Jack Frost and his goblins have stolen the magic sporty items so they can win by cheating! What's more, with the items missing, everyone in the human world is playing sports really badly, and so the human Olympics is in danger of being ruined too! 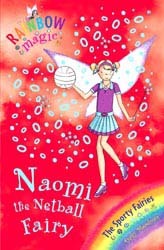 So where is Naomi's Magic Netball! ?